Local business marketing is an often overlooked niche in the marketing industry. It encompasses several other niches in marketing, such as content marketing and social media marketing, and optimizes them for local businesses. Its importance to local business is what is often overlooked. Many brick-and-mortar businesses may already have a toe or an even an entire foot dipped into online marketing, but online marketing is only intended to increase your online presence. This may sound beneficial, but it doesn’t necessarily mean that online presence is going to translate offline. In other words, having an active blog or a large social media presence doesn’t guarantee an increase in the amount of sales or revenue you earn from offline customers. We’re going to explore local business marketing in this post, specifically how it can be used to drive more traffic from the online platforms you use to your offline, brick-and-mortar business. Let’s get started. 1 What is Local Business Marketing? 1.1 What are Some Examples of Local Business Marketing? What is Local Business Marketing? We’ve already given a brief overview of what local business marketing is, so let’s switch gears and talk about what this type of marketing is in terms of what forms of local business marketing exist. In short, local business marketing is a form of online marketing designed to use your online presence to encourage users to make offline purchases of the goods and/or services you provide. This is why it’s important for you to increase your presence in local search so users can discover your business when they use search terms related to the products and services you offer. Is it important? Well, ComScore ran a few tests and discovered that 78% of local mobile searches result in offline purchases. They ran another test that found that 56% of mobile searches have local intent, so we’d say it’s pretty important. What are Some Examples of Local Business Marketing? Your Website – We’re going to discuss how you can optimize your website to enhance your local marketing business efforts. Google My Business – This is a platform Google offers that will increase the likelihood of your business appearing in Google’s local search results. Facebook Locations – This is somewhat similar to Google My Business, except it amplifies and draws more attention to your location-based Facebook pages. Advertising – When all else fails, throw a little money at the problem. This method involves increasing your local presence through the power of advertising. The search results consist of a few different components. The first, and most obvious, is the mini version of Google Maps. 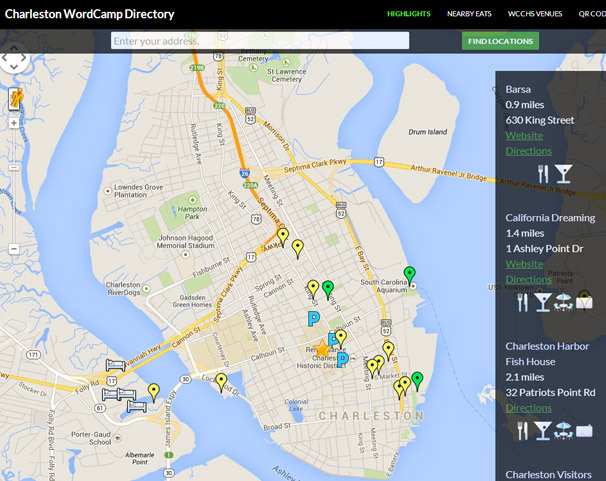 This map features icons that label where each business is located. Individual businesses are located beneath that, complete with their address, hours of operation and reviews. There are a few different ways you can optimize your website for local search. The first is to create separate websites for each and every location you operate. You can use WordPress multisite to accomplish this as it’ll allow you to develop and manage each individual website. You can even use store locator plugins to showcase location-based information automatically. WP Store Locator and Store Locator Plus are both wonderful options. You should also add your business information to your website. This helps Google’s algorithm pair your website with local searches that occur in your area. Content marketing, specifically content that features local topics, should also be a staple in your marketing strategy. By content marketing, we mean blog posts, podcast episodes, YouTube videos and similar forms of content. Lastly, you should tie everything together with email marketing. This can help you connect with your audience. Check out the next section to learn how. Google My Business is a service Google offers to give businesses the chance to enhance their search presence in local search results. Much of the information you see in a location-based search result is from one of these listings, which means users won’t be able to learn certain details about your business from Google without it. The traffic your business gets throughout the day. Website – This button contains a link to your website. Call – This button allows mobile users to call your business with a click of a button. 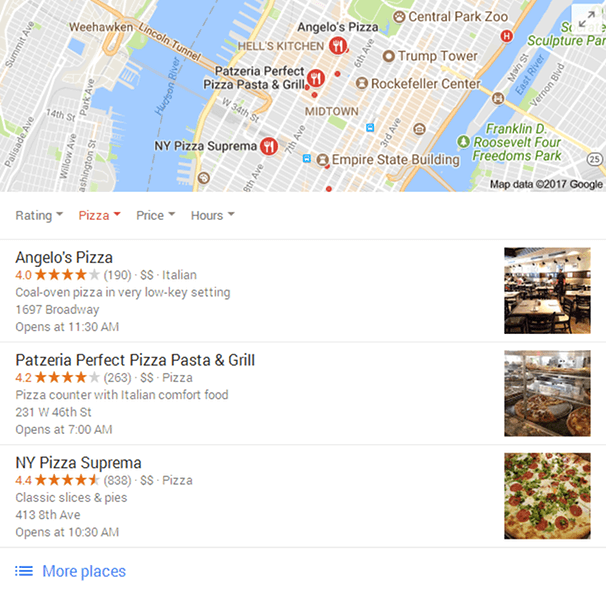 Directions – This button opens Google Maps and provides instructions on how to get to your business from the user’s current location. Lastly, you should focus on acquiring four and five-star reviews on Google. Google does not frown upon asking customers to leave honest reviews of your business, so don’t be too shy to ask customers to leave a review directly. You can do this in a few different ways, such as handing out flyers, sending broadcast emails to your email list, offering incentives, such as a coupon, and more. You should also reach out to customers who leave negative reviews. If you don’t have separate Facebook pages, also known as “Facebook local pages,” for each location you offer, your first order of business should be to create a different Facebook page for each location you own and operate. Facebook Locations is a simple feature, but it’s pretty useful. It allows you to connect all of your local Facebook pages and manage them in one area. Management tasks include creating new pages, editing information from current pages and managing each location. It also allows you to target local customers more accurately, especially if you’re using Facebook Ads. We don’t recommend using money alone to amp up your local business marketing game, but it can help you get the ball rolling. Google AdWords, for example, allows you to target users based on location. Facebook Ads are all the rage these days, and they do wonders for local business marketing. They allow you to target users based on a variety of different factors, including gender, age, location and interest. This form of advertising is most effective when paired with content marketing. You can create local content and free guides and advertise them to local customers on Facebook. For example, a mountain bike store located in Vancouver could write a small ebook called “Your Guide to the Best Mountain Bike Trails Near Vancouver” and advertise the book to users located in Vancouver. If they require the customer to provide an email address to receive their free copy, they can use the power of email marketing to encourage that user to visit the shop with coupons, sale announcements and more. An important part of your advertising strategy is being able to monitor the results and tweak your campaigns accordingly, it’s essential that you install Google Analytics and get used to reading and understanding the reports so you can see what works and what doesn’t. You can use analytics to monitor any sales or leads that come in and see what the traffic source was which will help you increase the budget for that source or cut out sources which are not producing a ROI for you. Local business marketing requires a lot of hard work that includes spending a lot of time and money optimizing the system you build, and that’s after you’ve worked hard to build it. If you’re having a tough time figuring out what to tackle first, just remember that local search is the most important component of local business marketing. This means you should focus on optimizing your website and Google My Business listing above everything else. Once you’ve finished with those and you have systems in place for content marketing and email marketing, you can move onto optimizing your Facebook pages. Advertising can be done at any time provided you have something worth advertising. If you want more information on how to step up your email marketing game, check out the following posts to help you understand it better.